Patrick D. McGorry, M.D., Ph.D., F.R.C.P., F.R.A.N.Z.C.P. In an approach to treatment of young people with mental health issues, Dr. Patrick McGorry seeks to replace “flawed conceptions from the age of steam,” including the notion that one must have a diagnosis before treatment can begin. His primary-care staging model of psychiatric illness stresses reaching the patient while his or her mind remains highly plastic, biologically. Intervening early offers the greatest hope for significantly impacting the course of psychosis, with the ideal being to prevent or delay it by treating preliminary symptoms quickly after they arise. 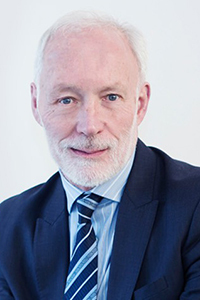 In their still-growing Australian network of over 110 “headspace” clinics for youth mental health, Dr. Patrick McGorry and his colleagues are putting into practice ideas at the cutting edge of psychiatry, ideas that he hopes will eventually replace “flawed conceptions from the age of steam.” This means two things above all, Dr. McGorry said last year in remarks written to help commemorate the 30th anniversary of the Foundation. One is shifting the focus to early diagnosis; the other, which is related, involves beginning treatment during the earliest stages of illness, and even before a diagnosis is possible to make, in many cases. This shift in focus “has shown that the course of illness is plastic and can be greatly improved if timely, evidence-based care is provided,” Dr. McGorry said. One thing he and his colleagues have learned in their headspace clinics is that treatment is most effective when it is begun immediately after a troubled youth enters the clinic. The treatment he is talking about usually begins before a diagnosis is determined. This has a profound implication: in Dr. McGorry’s view, the diagnostic categories that we are familiar with are often not even needed to begin helping a young person at high risk for mental illness or in the first stages of illness, no matter what the diagnosis might turn out to be. Critics have charged that this approach can lead to over-diagnosis and overtreatment. “It’s just the reverse,” Dr. McGorry insists. “We’re trying to provide care where it’s clearly needed, even when the patients have not reached the threshold to qualify for one of those more traditional diagnoses like schizophrenia or bipolar disorder, which can take years to become clear enough to actually make the diagnosis. And by that time, in our experience, the person already has been in need of care for months or years.” Perhaps the most valuable insight to emerge from his clinical experience is that damage is done – to the brain and to the person – if proper treatment is not begun at the very beginning of the disease process. This is the best time to intervene. Headspace is a primary-care model, McGorry explains. It is not specialized to particular diagnoses, but rather reflects what he considers a 21st-century notion of treating the manifestations of mental ill-health while these are still plastic. These manifestations – they could be symptoms, behaviors, genetic predispositions, or, in the period just ahead, biomarkers – combine in a person to generate what he calls “microphenotypes.” By this he means that youth who may ultimately receive a wide range of diagnoses may have some of these individual components of mental ill-health in common. The key point is to address the behaviors or symptoms as soon as they are manifest, and to treat them not only with medications, where appropriate, but importantly, with robust social, family, and developmental support, to the extent possible. This is the formula that has resulted in “symptomatic” recoveries of two first-episode psychosis patients out of every three within the first 18 months in the headspace clinics. Data on longer-term trajectories are being developed, McGorry says. He believes one reason the clinics have succeeded so far is that “they are stigma-free. And they are popular because people don’t worry about all the arcane debates that we have in psychiatry about diagnostic boundaries, or criteria or labeling. Ordinary people, including politicians in Australia, understand that these young people are in trouble. We’re trying to help them, trying to make it easy for them to seek help. The entry into headspace is ‘soft.’ We are welcoming; there are no barriers, including financial ones. Young people just come in and talk to someone. “We scale up the intensity of our response according to the needs the person has. Not just narrow medical needs. Medication can be part of it, but we’re also helping them get a job or finish their education or deal with substance abuse or relationships. These are young people in transition, trying to master developmental tasks, like identity. Many have sexual orientation issues. So it’s very holistic. We embed our psychiatric expertise within that kind of needs-based framework. Within that structure, we conduct [National Institute of Mental Health] NIMH-level research,” which has resulted in many publications and the start of a new journal to address this emerging field: Early Intervention in Psychiatry, published by John Wiley & Sons since 2007. Data from the headspace clinics also support the importance of engaging and following up with so-called ultra-high risk individuals, those with genetic and behavioral warning signs that mark what doctors call the prodrome, the period leading to a psychotic episode. Only one person in three in this high-risk group progresses to psychosis. In a certain number of these people, Dr. McGorry hypothesizes, the condition may resemble – surprisingly – asthma. “Certain young people may have a [biological] vulnerability, which they may grow out of,” he says. Others may progress to psychosis, but if treated comprehensively in the very earliest stages, the damage may be limited and the impact of the illness either attenuated or perhaps postponed for some number of years.